I’ve been in South Africa and the US recently. From geography to development both countries are, of course, very different. But they do share some similarities. Take inequality, for example. This issue – which is by no means limited to their shores – has become a deeply rooted feature of their social and economic landscapes, one that proven stubbornly resistant to attempted remedies. Inequality has many invidious consequences – too many to list here. This is because it is one of the few issues that spans both the micro and macro. From the parents who can no longer be confident that their kids will be able to ascend the ladder of opportunity, to the fact it leads to increased government spending on healthcare, it is clear that its impact stretches far and wide. That’s why we have placed inequality front and centre in the latest Sustainable Economic Development Assessment (SEDA). 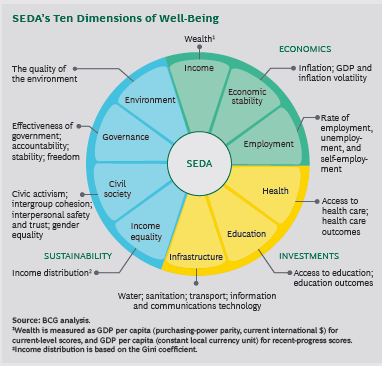 The report, which The Boston Consulting Group publishes annually, assesses the relative well-being of countries around the world and how well they convert wealth into well-being. This year we found that income inequality, together with a country’s governance and civil society, has a major impact on the well-being of a country’s population. Why is this so? It’s important at the outset to remind ourselves why we look at well-being specifically. The fact is that increased GDP, while still important, is no longer seen as conclusive evidence that a country’s economic policies are working. A country may have a growing economy but, at the same time, large swathes of its population can remain struggling, seemingly cut off from the prosperity enjoyed the rich and powerful, and with little or no prospect of any upward mobility coming their way. This issue has come to the fore particularly strongly in recent years. This is because the recovery of the global economy from the financial crisis of 2008 has not been felt by everyone. Sure, most businesses have bounced back and high net worth individuals are doing fine, but poverty rates remain high in many countries – both developed and developing – and the incomes of the poorest have stagnated or even declined. All this before the looming artificial intelligence revolution which promises to massively disrupt the labour market. Such trends also explain why many in society have turned against globalisation – even though it has undoubtedly fuelled economic growth over the past 20 years. No wonder, then, that back in 2013 President Obama called it “the defining challenge of our time”. He was right to do so. Yet in looking at countries’ wealth and growth rates over time, we have observed performance rarely varies dramatically. This, we believe, is due to their institutional foundations. Steeped in tradition and resistant to change, such systems and conventions have proven unable to radically shift the way a country can convert wealth into well-being. Conservatism – with a small ‘c’ – often wins the day. This unfortunate reality does not mask the fact that what policymakers really need to deliver is inclusive growth – prosperity that is shared way beyond the very top earners and trickles down to impact and improve the lives of the population as a whole. Sounds good, doesn’t it? Regrettably, turning this vision into reality is hardly the easiest of tasks. And while politicians tinker, the situation for the less fortunate in society is worsening. The main issue is that as overall inequality increases, so, too, does the gap between the income of populations in the lower and the average income. This, in turn, leads to reduced access to key aspects of well-being – such as a good education system and effective healthcare. We tested this theory in SEDA, exploring whether inequality has a detrimental impact on average well-being levels, and found, not surprisingly, that income inequality is indeed a drag on the ability to convert wealth to well-being. This conclusion has a number of repercussions. For example, the SEDA report specifically examined whether people living in countries with higher levels of income inequality are less happy than they otherwise would expected to be and we found are strong correlation between the two. Countries with high levels of income inequality tend to have a larger gap between well-being and happiness, according to our research. Such findings also serve as a vivid reminder for politicians and public servants alike that inequality is an issue that can be kicked down the road no longer. It needs confronting here and now – starting with addressing the flaws in those institutions which have prevented a more dramatic shift in the way countries can turn the wealth of their economies into well-being for all their citizens. The clock is ticking and the stakes are high. History will not judge kindly those whose paralysis today casts a shadow on those tomorrow.